DESCRIPTION: The dental arch is the most resistant body structure from those who have it. As an idea that we are all animals, part of a food chain, we use the mouth and teeth to defend ourselves / eat / live. I believe that the two biggest predators on planet Earth are the human being - Homo sapiens - wise man and the white shark - Carcharodon carcharias. 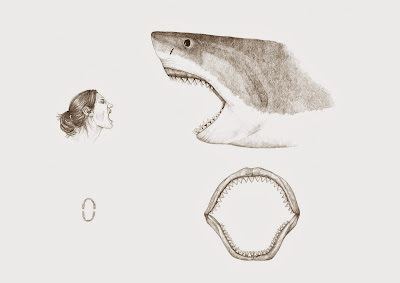 With his wisdom and thoughts, man develops technologies to survive while the White Shark uses their natural strength and powerful jaw to pierce and grind their prey. Despite the strength and size differences between the two kinds, I call the two largest predators for not having dominance about each other. From both mouths come threats. The human being kills white shark and the white shark kills humans.